Those who are sworn to protect our borders against threats foreign and domestic deserve our support. They are prepared to and often make the ultimate sacrifice for our freedom. Our American History is testament to the fact that freedom is not free. SWAT Fuel is proud to support our military by supporting military charities. The first 20% of our yearly donations benefit our US Military. If you know of a worthy charity that does great work for our soldiers, please feel free to toss their name into the hat. Please feel free to contact us. SWAT Fuel is proud to support them. Law Enforcement Agencies, Emergency Medical Services and Fire Departments need our help. In the face of budget cuts, job related injuries or loss of life, our public safety personnel need our support. The second 20% of our yearly donations benefit our public safety warriors. These men and women protect us from crime, fire and medical threats. It’s time for us to give back and give them the support they deserve. 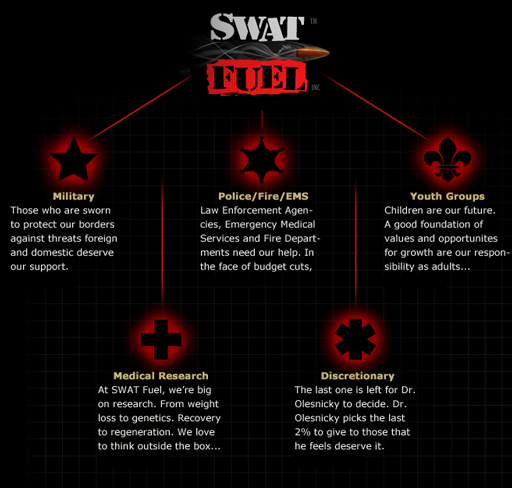 SWAT Fuel is proud to support them. Children are our future. A good foundation of values and opportunites for growth are our responsibility as adults training our youth for the future. At SWAT Fuel, we want to make sure that our future warriors have the opportunity to grow into wise and capable leaders. If you know of a worthy charity that does great work for youth groups, please feel free to toss their name into the hat. If you represent a worthy charity. At SWAT Fuel, we’re big on research. From weight loss to genetics. Recovery to regeneration. We love to think outside the box and to stay on the cutting edge. If your organization does cutting edge research or you know of one, please feel free to contact us. The post SWAT Fuel charity donations appeared first on SWAT Fuel, USA Based Nutraceutical Manufacturer.